Definition at line 839 of file btrfs_drv.h. Definition at line 848 of file btrfs_drv.h. Referenced by add_device(), add_volume_device(), AddDevice(), do_write2(), find_device_from_uuid(), finish_removing_device(), load_chunk_root(), mount_vol(), mountmgr_process_drive(), remove_volume_child(), update_volumes(), verify_device(), vol_check_verify(), vol_close(), vol_get_device_number(), vol_get_disk_extents(), vol_get_drive_geometry(), vol_get_length(), vol_ioctl_passthrough(), vol_is_writable(), vol_read(), vol_write(), volume_arrival(), and volume_removal(). Definition at line 849 of file btrfs_drv.h. Referenced by add_device(), add_volume_device(), do_write2(), find_device_from_uuid(), finish_removing_device(), load_chunk_root(), mount_vol(), mountmgr_process_drive(), remove_volume_child(), update_volumes(), verify_device(), vol_check_verify(), vol_get_device_number(), vol_get_disk_extents(), vol_get_drive_geometry(), vol_get_length(), vol_ioctl_passthrough(), vol_is_writable(), vol_read(), vol_write(), volume_arrival(), and volume_removal(). Definition at line 847 of file btrfs_drv.h. Referenced by add_device(), add_volume_device(), finish_removing_device(), mount_vol(), and remove_volume_child(). Definition at line 851 of file btrfs_drv.h. Referenced by add_volume_device(), and remove_volume_child(). Definition at line 846 of file btrfs_drv.h. Referenced by add_device(), add_volume_device(), finish_removing_device(), mount_vol(), and vol_get_device_number(). Definition at line 843 of file btrfs_drv.h. 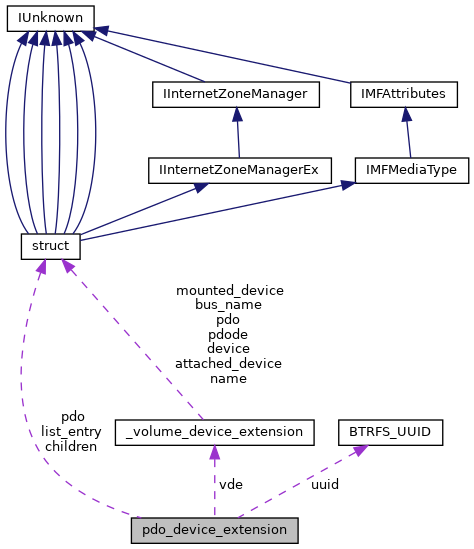 Referenced by add_volume_device(), AddDevice(), bus_query_device_relations(), and mount_vol(). Definition at line 844 of file btrfs_drv.h. Definition at line 840 of file btrfs_drv.h. Definition at line 841 of file btrfs_drv.h. Referenced by add_volume_device(), AddDevice(), pdo_query_device_id(), and vol_query_unique_id(). Definition at line 842 of file btrfs_drv.h. Referenced by _Function_class_(), add_volume_device(), AddDevice(), mount_vol(), volume_arrival(), and volume_removal().